Indy Rookie Fest in Nekoma resort was a blast! For the first time also in Japan we had a “Rookie Workshop” at night. International Judge “Ishi” explained to kids “How to Travel” and more good tips to “How to Communicate friends from overseas”. Kids enjoyed not as square class room style =) So we started with the contest, trying to win a spot for the prestigius World Rookie Finals in Kaprun. Watch the video report below! Contest day welcomed all the riders with perfect conditions and blue bird but after the training clouds arrived.. Flat light, fog .. during the fist run. Then started get better in the 2nd run and after the park reshape started snowing bit. On the girl’ side 10 riders competed for 2 runs, the best counted. Third place for Hinari Asanuma Grom Girl）with 66.50points. She competed in the World Rookie Final 2016 – result 12th. Her winning run was: Cab5, NoseGrab, B3Indy, 50 NoseSlide, 50 F180Out. Second place for Yuuna Komuro (Rookie Girl) she also entered Rookie Finals in 2016. First place for Aoi Takahashi（Rookie Girl）with 76.75points with a solid run: Cab5 → F3 → WallRide → BS 27 in BoardSlide 27 Out → BS NoseSlide. She had stable style and solid run! Total 35 boys competed and after quali stage we had in the final 13 boys, 2 runs best counted. This years “Indy Park Jam Rookie Fest” had an intense level. Names as Ryo Izawa, Yuto Yamane, Kaito Hamada (Grom Winner of WRF 2014 ), Yutaro Miyazawa (Winner of 2016 Indy Park Jam)! There were the amazing young Grom Hirono Ogiwara, age 11 who took 3rd for his small body and bag of tricks. 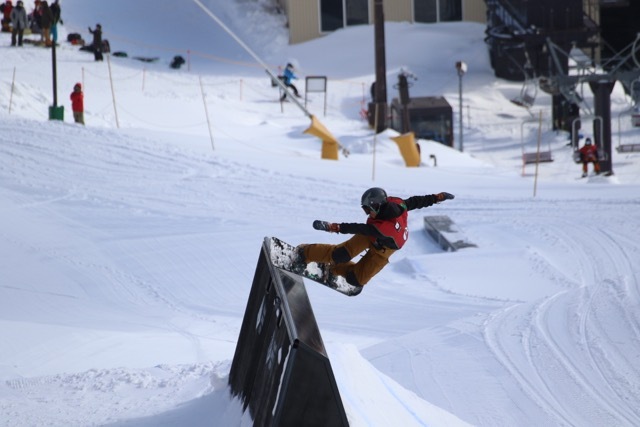 Ruki Tobita（Rookie Boy）won with 86.50 points with a solid run: cab9, Front 12, Switch Tail Slide 27 Out, Switch NoseSlidet and Cab 270 Hardway. Style with controlled riding for him! Winner in the Grom category Hiroaki Kunitake with 89.50points. His impressive run: W BF Indy → B WC 10 Mute → FS LipSlide 27 Out → Tr 360 on 50/50 360 Out → BS LipSlide 27 Out. World systematically Judging team “IJC Asia” made results accurate and smoothly, and thanks the sound system and Best MC for pump up kids! “Pyramid SnowPark Design” Crew built the park exclusively for this event! Thank you so much! You guys Rock! 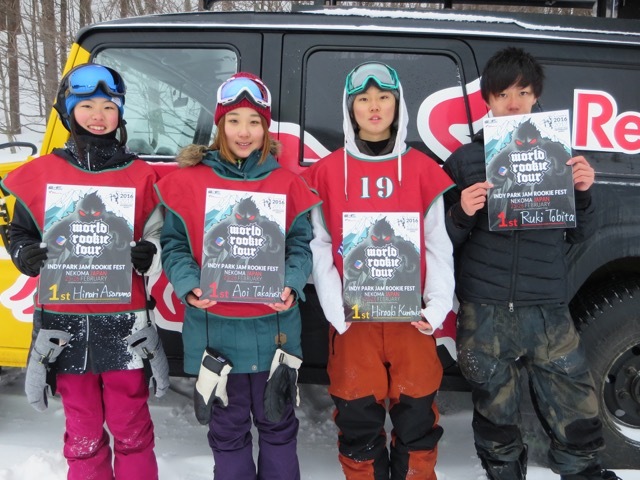 Thanks for incredible support for the event every year: Burton, Redbull and Nekoma Resort!! All the pictures from Indy Rookie Fest here.